Pan fry or grill for 10-15 minutes... try serving with a rich sun-dried tomato sauce on a bed of your favourite pasta. Prime British pork from pigs born outdoors and reared in airy, straw-bedded barns. 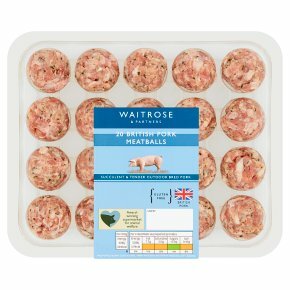 Waitrose pigs are reared to produce high quality, succulent pork that is tender and full of flavour. They are fed a balanced, cereal based diet on carefully selected British farms, exclusively for Waitrose. We work with a long-established group of dedicated farms; selecting them for their high standards of animal husbandry, welfare and a commitment to sustainable farming. INGREDIENTS: pork (87%), water, rice flour, gram flour, parsley, salt, sage, maize starch, preservative (sodium metabisulphite), black pepper, nutmeg, white pepper, ginger, dextrose monohydrate, mustard powder, thyme, mace, chilli powder. Grill Time: 10-15 minutes. Grilling Instructions: Preheat grill. Remove all packaging. Place on a grill rack under a medium heat turning occasionally. Cook thoroughly until the juices run clear and there is no pink meat.